Rounding Cape St. James, we stood off the rocky Kerouard islands, one of the two Steller sea lion rookeries in Gwaii Haanas. These giant pinnipeds looked like huge, golden slugs resting on the sun-warmed rocks. With over 600 breeding sea lions using this rookery, and because they are extremely sensitive to disturbances, we stayed well off and observed. 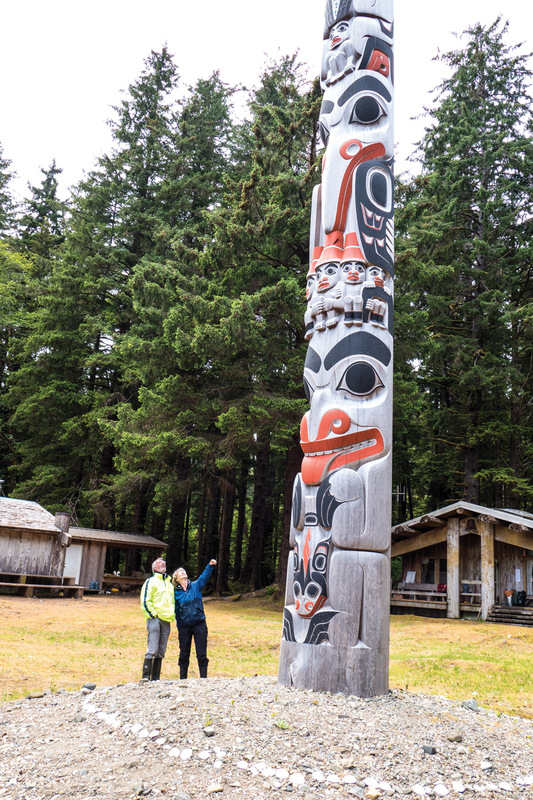 A replica totem reaches high to the sky in the Haida Heritage Site. The waters around Gwaii Haanas are filled with marine life, currently more than 3,500 marine species. Humpback whales became almost a common sight, but we never tired of seeing them. Matt always brought us within a safe distance, stopping the boat to observe their antics. A pod of Orcas also chose to visit us but they were moving so fast they weren’t around very long. And Risso’s dolphins, one of the larger dolphin species, which usually stay offshore, frolicked around us. Gwaii Haanas National Park Reserve, National Marine Conservation Area Reserve and Haida Heritage Site is the only reserve in the world that protects from the top of the mountains to the depths of the sea. In an unusual collaboration between the Council of the Haida Nation and the Government of Canada, a consensus-based, decision-making model works towards protecting both the cultural and ecological heritage for future generations. This unique arrangement was brought about by the 1985 standoff between the Haida and the logging industry on Lyell Island. When we visited Hlk’yah GawGa or Windy Bay on the island, we saw the Legacy pole that was raised in 2013, to commemorate the 20th anniversary of the agreement. 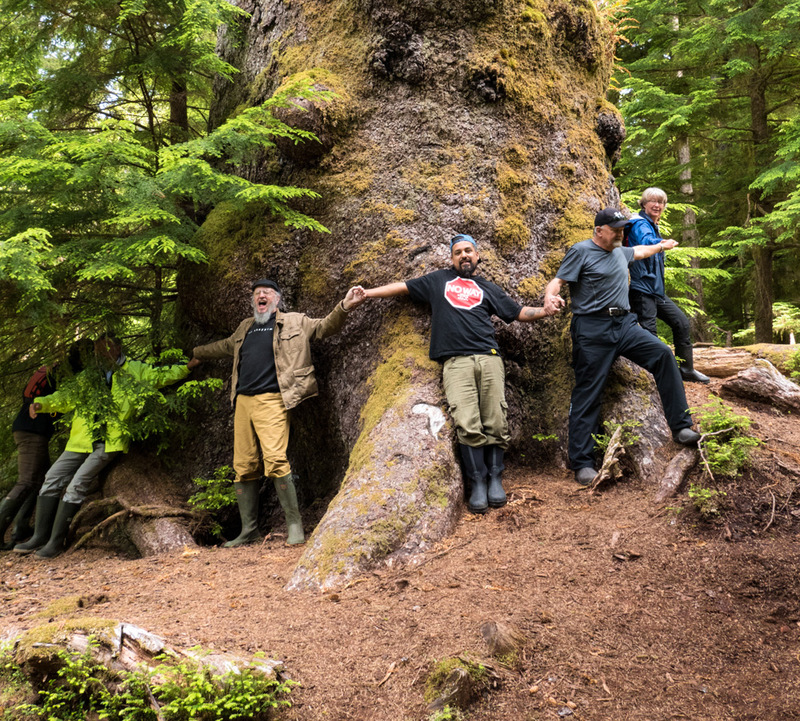 It is the first monumental pole raised in Gwaii Haanas in 130 years. All five of the Haida villages are unique and we were lucky to visit all of them. They are watched over by Haida Watchmen, a program that began in 1981 and which operates during the summer months. James, our Watchman’s family on his father’s side is from K’uuna Linagaay, or Skendans and visiting the village was a very emotional time for him, as he doesn’t visit often. He showed us the ancestral home with its deep pit and fallen beams and corner posts, all moss-covered and returning to the earth. During our time on Passing Cloud, we observed a wide variety of flora and fauna unique to Gwaii Haanas, including the elusive, indigenous Haida Gwaii black bear (ursus americanus carlottae) that we saw on our float trip up Burnaby Narrows, a biodiversity hotspot. The bear was ambling along the bank just above the intertidal zone and ignored us completely. As we hung back, he (or she) walked down and swam to the other side of the narrows, allowing us to move on. The trees grow to great heights and widths. With the strong tidal action through the narrow, 164-foot channel, the marine species are supplied with a constant stream of plankton and nutrients, creating an enormous concentration of life. With the water so clear, visibility is excellent but we had the added advantage of first mate Kyle’s snorkeling ability, as he went overboard in a thick wetsuit and retrieved specimens for us to look at. Sea slugs, bat stars of many colors, a bizarre “decorator crab” and a huge moon snail. Of course, these were replaced within a couple of minutes to prevent any damage to them. For those of us not keen to dive in, we got a firsthand look at the underwater world when we went to “the dock” for water. Expecting to see a marina-style facility, we eased onto a small floating dock tethered to shore with several hoses that brought water from the local spring! The biggest surprise though, was the marine life attached to the dock. Brilliant colored anemones and other creatures were clinging to the floats, in colors I only expect to see in the tropics.